A tasty Mexican twist on a family favourite. Heat the oil in a deep frying pan or saute pan. Cook the onion over a medium heat to soften. Increase the heat, add minced beef and cook until browned, breaking it up with a wooden spoon. Add garlic, red pepper and Taco seasoning and cook 1 minute then stir in tomatoes, kidney beans, puree and 150 ml water. Cover and simmer for 15 minutes until thickened, season if needed, then turn into and ovenproof dish. While the meat mixture is cooking, heat the oven to 200C/400F/gas mark 6. Peel the potatoes and cook in lightly salted water until tender. Drain very well, then mash with the butter. 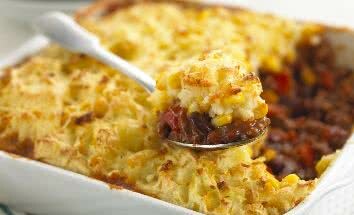 (if the potatoes are a little dry, add enough milk to make them soft and creamy ) Season and fold in the drained sweet corn. Tip: If you prefer to use spices instead of the Taco seasoning measure 2 tsp chilli powder, (mild, medium or hot depending on taste) 1 tsp ground cumin 1 tsp paprika and 1 tsp dried oregano. Another Mexican tip, add 1 tbsp finely chopped Old El Paso pickled jalepeno chillies to the potatoes mixture.